Definition: Genetic disturbances in enamel formation leading to altered morphology of enamel. There is normal dentin and pulp formation. The teeth will appear yellowish brown. There are four general types (hypoplastic, hypocalcified, hypomaturation, and hypomaturation-hypocalcified with taurodontism). Below I’ve described general findings of amelogenesis imperfecta and not for one specific type. Shape: Thin (or completely absent) to normal thickness of enamel. 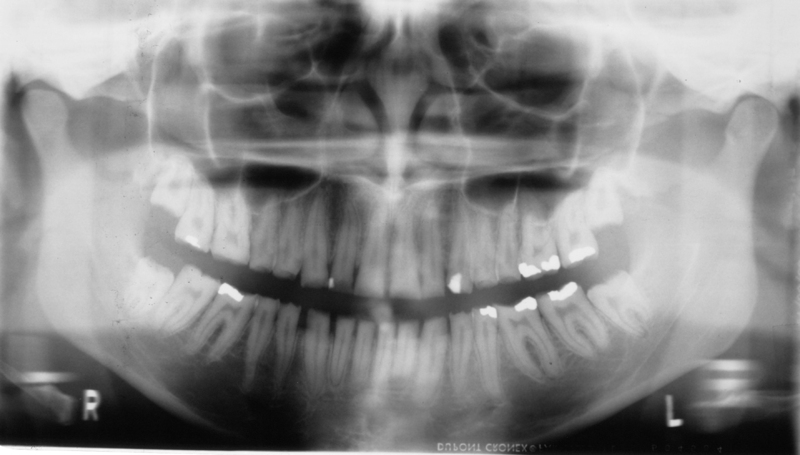 Crowns tend to have a ‘square’ shape with multiple open contacts present. Internal: If enamel is present, it is radiopaque but is the radiopacity of dentin (which is less than normal forming enamel). Number: Associated with all teeth in the oral cavity. Any resource for a breakdown by type for the curious dental student? Other than the White and Pharoah Oral Radiology book, I’m not aware of any. I can work on putting together a post on it but won’t have radiographic examples of all the different types.